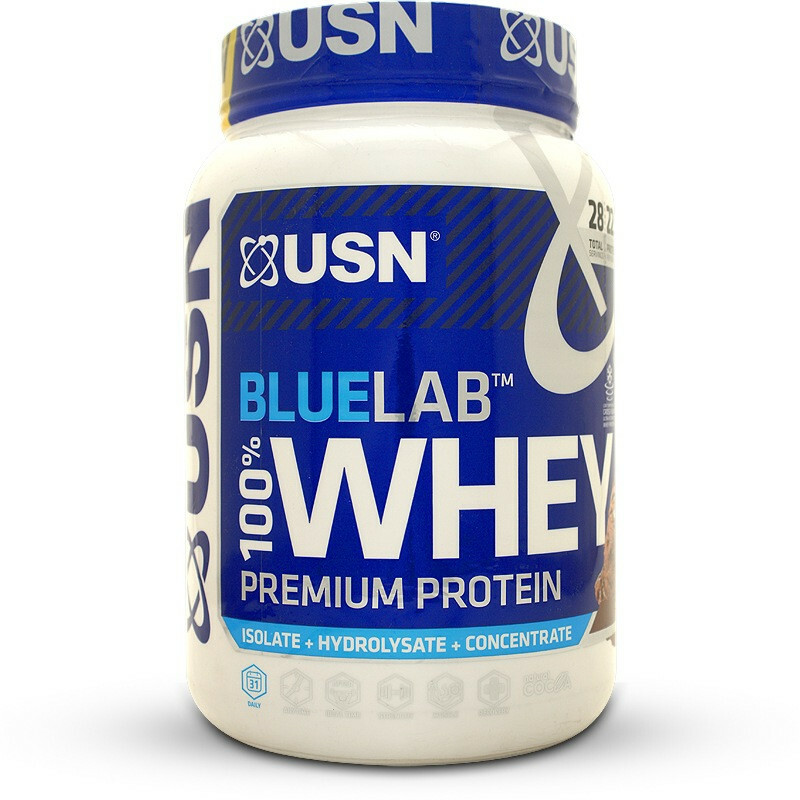 USN Bluelab 100% Whey Premium Protein was developed with professional athletes to give you a high-quality great tasting shake. For muscle gains you need protein from meat, dairy and plants. Yes, peas have protein! 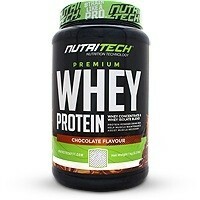 Lifters and athletes supplement their protein with a whey shake which they drink around their workouts. 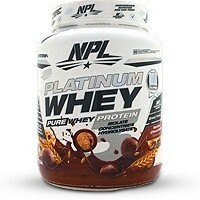 Each serving gives you 22.3 grams of a premium protein blend for optimal usability. To consistently train at your peak you need to recover from your workouts. 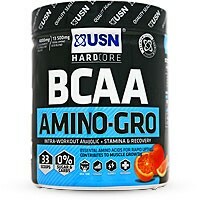 Drinking a protein shake after your gym sessions gives your body vital branched chain amino acids (BCAAs) which repair and build muscle tissue. 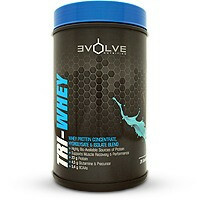 This protein shake is suitable lactose intolerant individuals due to the addition of a digestive enzyme called Tolerase L.
USN reached out to professional athletes and the retail industry when developing their Bluelab series of products. 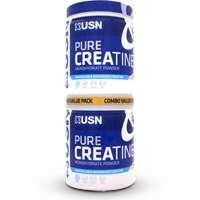 They incorporated all the feedback to produce market-leading supplements. Athletes want great tasting shakes. During their Bluelab development cycle they dialed in the flavouring to deliver one of the best tasting shakes currently available. The 3.2 kg tub offers lifters with the best value by providing 100 servings which should almost be a two month supply depending on usage. USN has listened to athletes and their customers when they formulated Bluelab 100% Whey Premium Protein to engineer one of their best protein shakes yet. * Nutrient Reference Values (NRVs) for individuals 4 years and older (2010). 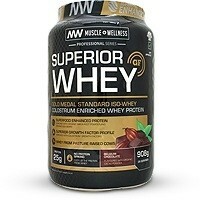 Protein blend [Whey Protein Isolate, Whey Protein Hydrolysate, Whey Protein Concentrate, Milk Protein Concentrate], Cocoa Powder, Flavouring, Sodium Chloride, Stabiliser, Non-nutritive Sweetener Blend (Sucralose, Acesulfame-K), Tolerase™ L (pH-stable lactase). Contains lactose (milk sugar), but suitable for lactose intolerant individuals due to the addition of Tolerase™ L (Lactase enzymes). May also contain traces of peanuts, tree nuts or crustaceans. Whey may contain traces of soy (from lecithin). • Mix 1 scoop (32 grams) into 150 – 200 ml of cold water. 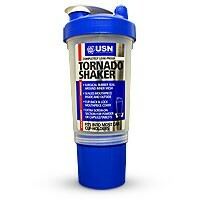 • Shake well for 30 seconds, settle for 60 seconds, shake again before drinking. • Drink a serving straight after your training. • An additional serving can be taken first thing in the morning before breakfast. • Adjust your protein intake from 1-5 servings depending on your physical goal and protein requirements. Consult with your doctor prior to use, especially if you have a medical condition. Not suitable for pregnant/lactating women, or individuals under the age of 12. Individuals 12 – 18 years should not exceed one serving a day, especially if taking in high quantities of dietary protein sources. Do not exceed the recommended daily intake.